“This is really a motorcycle with a capital ‘M’ for me” I think to myself inside my helmet after riding several miles on the KTM 950 Supermoto. There are loads of dream bikes out there and I have ridden most of them. But even so, the 950SM rumbles the loudest on my built-in Richter scale. However, the 990 Super Duke is faster on the highway and the engine sings in my head until it takes over. But which shall I choose? 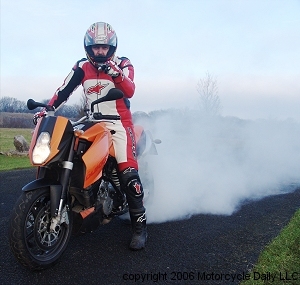 The 990 Super Duke was first born as a creative concept drawing in 2003. In September 2003 KTM showed the first pictures of the concept model. The next year KTM decided that it should be produced exactly as it was. By early 2005 the bike was on sale. The path from concept to finished product is a short one and the Austrians like to keep their style youthful. But what on earth would you use a 100 hp V-twin in a supermoto for?? If you think, as I do, that you have the answer, then you know what you would use the 990 Super Duke for (although the 950SM may be more touring-friendly). Both models are distinctive in their youthful, crazy KTM image- orange and proud of it. Even so, it is the 950 Supermoto that is most special in that it has created its very own class. Just as the Ducati Monster was the start of the street fighter revolution that has brought us bikes such as the 990 Super Duke, the 950SM has started the ‘king-motard’, ‘Hypermotard’ or ‘super-supermoto’ wave. (Two of these expressions were coined by yours truly, the other comes from Ducati.) Ducati is, for now, the only manufacturer following KTM’s example. However, we expect more to follow next year. 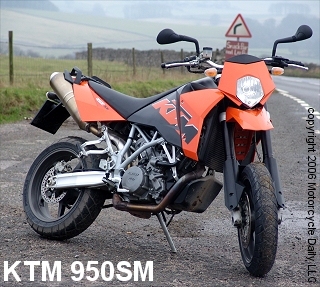 If you thought that a 650cc supermoto was good fun, then the 950SM is all that and more. Yes please, supersize me. The ultra-long wheel travel gives precision on poor road surfaces so that you can just concentrate on enjoying the riding. The 950SM takes to city kerbs just as well as country lanes where the cow muck is strewn along the narrow road. The 950cc motor from the Adventure gives extra acceleration and top speed. This supermotard reaches 125mph effortlessly, where a single-cylinder bike would start to struggle around 100. A large, 100hp V-twin possibly manages long trips more comfortably, and accordingly KTM has top box and tank bag available as accessories to the 950SM. In addition the luggage rack on the back of the 950SM has a great grab rail for the pillion. It is here that the 950SM begins to sail past the 990 Super Duke. There is no place to attach a rack for a top box to the 990 Super Duke and there are no grab handles for your pillion. But maybe you aren’t particularly bothered about practicalities on a bike like this. The fact of the matter is that the 950SM does widen your possibilities for touring whilst at the same time being just as entertaining to ride. One thing the 950SM can’t beat is the cutting edge 118bhp 999cc engine sitting in the Super Duke. 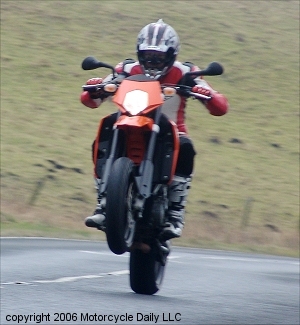 On the motorway, the Super Duke has masses of speed in reserve and striking acceleration. The Super Duke’s fuel-injection is finely-tuned and it is not difficult to distinguish between these two bikes when the fuelling is concerned. The 950SM has two Keihin 43mm carburetors and especially when coming off the throttle you can spot the difference. You get a good old-fashioned burbling from the exhaust pipes and the transition when coming off the gas from full throttle is not exactly subtle. It is again a sign of how good the Keihin fuel injection on the Super Duke is. One problem with the Super Duke is that the fuel indicator can’t measure the last quarter-gallon of the 4-gallon tank, essentially giving a fuel capacity of just 3.75 gallons. This means that it doesn’t take long for the fuel warning light to come on. Another slightly irritating thing is that the fuel indicator stays on for a while after you fill up. The 950SM on the other hand has a slightly bigger 4.6 gallon fuel tank. In exchange for this, it weighs a little more, uses double carburetors and has a more upright sitting position that gives more wind resistance. With our fuel consumption estimates we clocked up about 125 miles/tank with the 990 (31mpg) and 150 miles on the 950 (33 mpg). Conclusions? The 990 Super Duke deserves a larger tank. Both models have 48mm forks from WP, but totally different wheel travel. The 990 Super Duke is in its element on the tarmac roads, whilst the 950SM lends itself to gravel roads as well with the help of a more knobby tyre (Pirelli Scorpion) and the longer wheel travel. The 990 Super Duke has a more sporty geometry, is physically smaller and 15lbs lighter. The seat height is tall on both bikes, and there is only 10mm difference between the two. In comparison with the Ducati Monster and Aprilia Tuono, the Super Duke seat is very high (a lofty 33.6in). In spite of this, you don’t get a top-heavy, unstable feeling once you are moving. Both bikes have a long aluminium swing-arm that ensures that all the horsepower is firmly planted on the tarmac without the front wheel necessarily having to wheelie up. If the need arises, both bikes are ready for most things that you might need from a bike. The brake systems are splendid on both of the bikes and well suited to the different riding styles. On the 950SM you’re expected to lock the back wheel (in race mode) and steer long into the turn and thereafter accelerate hard out. Therefore the 950SM has a strong 2-piston rear brake whilst the Super Duke has a weaker 1-piston caliper. KTM has really splashed out on Brembo goodies on the front end of the 950- the brakes can be a little hard to judge when light application is required, but heavy braking is where they really shine. The 990’s 4-piston caliper has sensitivity and strength in abundance. Even if the radial brakes on the 950SM are good, they aren’t as sensitive and are therefore difficult to moderate, especially when you only need a slight adjustment. When it comes to pure strength, the 950SM has literally more than enough. The 990 also has what it needs but with added sensitivity and less raw strength. In short, they both get a big plus for the brakes! The 990 Super Duke is out to impress with its great acceleration even at high rpm. The bike feels light and steers easily, allowing effortless mid-corner line changes. The sound from the 999cc 75-degree twin leaves you with no doubt as to its 118hp. First gear is fairly tall, but by 4000rpm you really have to hold onto those Renthal handlebars. The 950SM is geared a bit lower and is a bit rougher in its stride. The foot controls are coarser and more suited to big MX boots. The cluster has only a speedo and no trip-counter. It is easy to forget about the world around you and in particular the 950SM is great fun on the B-roads. The grunt of the engine gives an immediate kick and the suspension allows for most things. Full speed into the bends, hop on the brakes and then shoot out again. By contrast, the 990 Super Duke is ridden more like a sports bike with slightly slower entrance into the bends, but higher speed mid-turn. The Super Duke is essentially a sportbike without the faring. Conclusion – The intention of this test was to find out which of these bikes gives the best fun-for-money. They both lend themselves to completely different riding styles and your preference for the ergonomics would be enough to enable you to choose between them. Irrespective of the above, we are left feeling that the 950SM is one of the most enjoyable rides ever, slightly more fun than the Super Duke – but it is a close call. The 990 has to accept defeat by the world’s largest Supermoto. The 950SM gives you more for your money in terms of a bigger fuel tank and better provision for pillion and luggage. It looks more sparse, but has something about it that makes it just as attractive as the 990. Details that stand out are the diamond-shaped headlight and the two-parted design on the fuel tank sides. 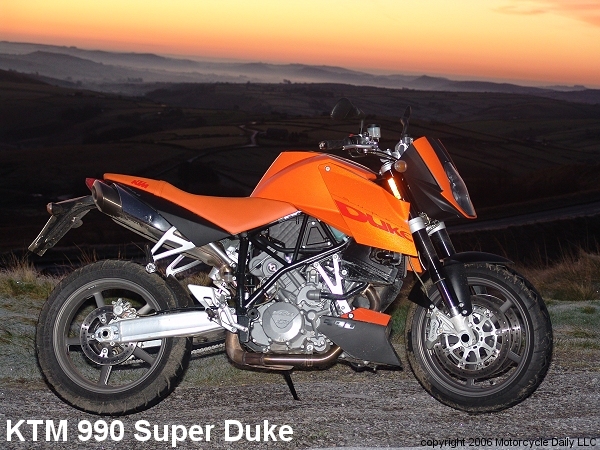 The 990 Super Duke has metallic orange paint, orange seat and clever design on the high exhaust. There is no doubt that you will be noticed whichever bike you choose, but personally I’m saving for the 950SM.